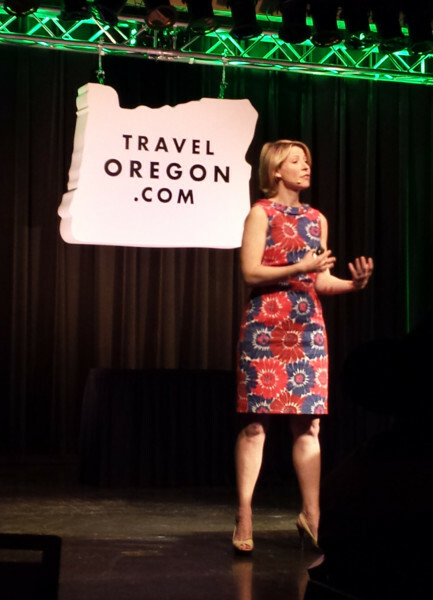 The Oregon Tourism Commission (dba Travel Oregon) is proud to announce the recipients of the 2015 Travel and Tourism Industry Achievement Awards, presented at the 2016 Governor’s Conference on Tourism in Pendleton, Ore. The annual awards recognize people and organizations across the state that go the extra mile to enhance the travel and tourism industry in Oregon. The award recipients are outstanding examples of professionals who, by virtue of their vision, perseverance and dedication, are a credit to Oregon’s tourism and hospitality industry. The state’s most prized recognition is the Governor’s Tourism Award. This year’s award recognizes the sister park agreement between Crater Lake National Park and Wuyishan National Scenic Area (a UNESCO World Heritage Site in China). To honor their efforts in finalizing the agreement, the award was presented to Carolyn Hill, Executive Director of the Crater Lake National Park Trust and CEO of Travel Southern Oregon, and to Craig Ackerman, Superintendent of Crater Lake National Park. The Gene Leo Memorial Award was established in 1994 to honor the late Gene Leo, known for his Oregon tourism contributions as Director of the Oregon Zoo, Portland Rose Festival and the Portland Oregon Visitors Association (now Travel Portland). Gene revered Oregon’s natural beauty, loved her people and enjoyed the outdoors with gusto. This award recognizes an outstanding contribution for a tourism-related activity or attraction focused on Oregon’s natural beauty or outdoor recreation. The award was presented to the Willamette Riverkeeper, for its efforts to protect and restore the Willamette River. The group also provides opportunities to learn and explore the river through paddling trips and presentations from its River Discovery Education Program. The Outstanding Oregon Tourism Volunteer Award recognizes the significant commitment by an individual or a group of individuals who exemplify the positive impact volunteers have on Oregon’s travel and tourism industry. The award was presented to Marie Longfellow of Cottage Grove, for her work leading the city’s graffiti rapid response team. Longfellow voluntarily assists the city in removing graffiti from covered bridges and other high-traffic locations to keep Cottage Grove beautiful. The Oregon Heritage Tourism Award recognizes outstanding incorporation of Oregon’s authentic cultural or natural history as a way to draw visitors to the state. 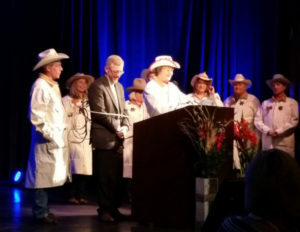 Distinguished as America’s longest running community pageant, the Happy Canyon Indian Pageant and Wild West Night Show and its 800 volunteers lauded this year’s award. Volunteers recreate the history of Pendleton, beginning with the proud traditions of its first citizens, the peoples of the Cayuse, Umatilla and Walla Walla nations. They then trace the arrival of settlers in search of a new promised land, and the coming of the cowboys who have forever left their mark on the frontier town. The pageant runs annually in conjunction with the Pendleton Round-Up. The International Sales and Development Award recognizes excellence in the creative sales, marketing and development of Oregon as a destination in the international marketplace. The award was given to Lorna Davis, Executive Director of the Greater Newport Chamber of Commerce. An ambassador for the state, Davis helps sell Oregon to visitors across the globe through creative and collaborative efforts at international trade shows and by facilitating familiarization tours. The Oregon Tourism Development Award recognizes creation of an innovative program, promotion, or product, utilizing best practices, sustainability, and creative problem-solving. This year’s award was presented to the Redfish Rocks Community Team for their efforts in creating a Scuba fill station in Port Orford. As a result of this new infrastructure, an additional 135 miles of coastline are now easier to access for Scuba activities to take advantage of year-round diving conditions. The Outstanding Oregon PR Initiative Award recognizes the best domestic PR program that resulted in quality earned media coverage and inspired travel to Oregon. The Jupiter Hotel earned the award for its efforts to position itself as the epicenter of Portland’s artisan community by focusing on local partnerships. The hotel’s #Portland blog focuses on local beer, food, music, arts and travel and its “Portland Experience” packages highlight these same destination activities. The Outstanding Oregon Social Media Program Award recognizes the best international or domestic social media program that engages or inspires potential travel to Oregon. For the second consecutive year, the award was presented to Oregon’s Mt. Hood Territory. It’s “Win Bigfoot’s Dream Date” two-month campaign netted 995 contest entries and 416 new email subscribers while engagements on Facebook, Instagram and Twitter swelled. The interest in Bigfoot from this short campaign has spurred integration into future marketing strategies. The Outstanding Oregon Visitor Guide Award celebrates the best domestic or international content program that inspires potential travel to Oregon. Oregon’s Mt. Hood Territory earns the award for its 2015 Travel Planner. The 36-page book was created as a trip-planning resource, but its photography, local voices and easily digestible content inspire visitors to keep the publication as a point of reference and to display it once their journey is complete. The Oregon Outstanding Advertising Award recognizes superior advertising communication, regardless of budget size or medium. The award was presented to the Tillamook County Creamery Association for their Co-Op advertising campaign that targeted dairy lovers everywhere who believe in the power of real, honest food, and encourages these everyday people to make decisions about the company’s products. The Outstanding Oregon Website Award celebrates websites that utilize industry best practices in design, technology, strategy and content to impact travel to Oregon. The City of Seaside Visitors Bureau earned the award for www.seasideor.com. In a colorful, simple and informative format, the website allows visitors to navigate easily so they can spend less time online and more time walking the Promenade, enjoying the carousel or riding the waves where surfing conditions are known as some of the best in the Northwest. The Outstanding Overall Oregon Marketing Program Award recognizes the best integrated domestic or international overall marketing program or campaign that attracted visitors to Oregon. The award was presented to the Central Oregon Visitors Association for its “Adventure Calls” campaign. Targeting young adults in the Bay Area and Pacific Northwest, the print, digital and social campaign connected with travelers interested in adventure, trying new things and making memories. Website sessions increased 141 percent and the California audience grew by 334 percent. Most telling of the campaign’s success, occupancy rates rose by 4.9 percent. The Oregon Tourism Leadership Award recognizes individuals who champion the value of tourism and whose leadership behind the scenes contributes significantly to the recognition and impact of Oregon’s travel and tourism industry. Paving the way for the next generation to gain knowledge and a growing passion for tourism, Melissa Steinman, owner of the Kayak Shack in Waldport, earned the award. A Waldport High School teacher, Steinman runs and operates the Kayak Shack alongside her students in an effort to educate them on tour operating. She has also received a grant to fund tourism curriculum to allow students to learn more about getting jobs in coastal tourism and rural marketing.